What would be a valid routing from LHR to PPT? I was thinking of either the SCL-PPT flight or HNL-PPT flights. Could I do LHR-LAX-HNL-PPT as one award on BA/AA and HA? 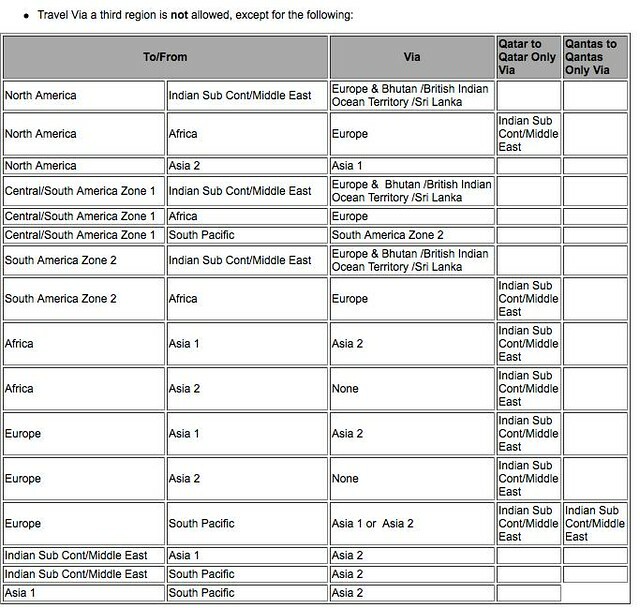 Europe <-> S. Pacific can connect in Asia or middle east using QR or QF-- all carrier published fare/routing allowing, of course. QF doesn't fly to PPT though. So does this mean that a award is not possible through AA? Just curious; what about TN's direct flight CDG-PPT (which is via LAX)? It's a darn good question. Seeing as it's one flight #, I have to wonder if it's allowed, and, I think I've seen folks reports using that flight as an award? But have to see if my memory is correct that some have reported getting that as an award-- very possible I'm confusing it with the TN/AF-codeshare LAX-CDG thing. If IB doesn't offer an unconstructed fare for MAD-NRT-PPT or MAD-HKG-NRT-PPT, there will not be single award availability ever. Interesting, as awards using IB's co-owned partner, BA, are possible. I sent a request to them via social media to look into this, but am not holding my breath, particularly as reasonable connections appear to be possible one way only at present. I have tried to book TN's CDG-(LAX)-PPT service in the past and was told two awards would be required as the flight proceeds via NA. Funnily enough, some agents suggested this routing given the difficulties with the other flights but were disabused of the notion when they tried to book it. I have tried to book TN's CDG-(LAX)-PPT service in the past and was told two awards would be required as the flight proceeds via NA. Interesting, as awards using IB's co-owned partner, BA, are possible. I didn't realise the post directly above mine was also discussing PPT routings. BA awards are booked by BAEC rules. AA awards are booked by AAdvantage rules, which state that in addition to the routing restrictions (such as single award Europe to S. Pacific can't transit N. America), the primary/overwater carrier must publish an unconstructed fare from origin to destination. So would MAD-SCL-PPT be a valid routing? But I too recall someone posting on FT that they were able to book the TN CDG-PPT through-flight as a single award (along the same lines of being able to book LAN's LAX-SCL through-flight as a single award, even when it transits LIM in the South America 1 zone). I think the most likely route for LHR-PPT would be via Asia and AKL. However the TN flight from AKL is only Su-Tu-Thu and you must connect so that you are in AKL for less than 24h. Both QR and CX fly one-stop to AKL.